KATHMANDU, March 3: Nepal Students' Union (NSU) and All Nepal National Free Students Union (ANNFSU) have made conflicting claims about winning most of the colleges where the Free Students Union (FSU) elections were held on Wednesday. 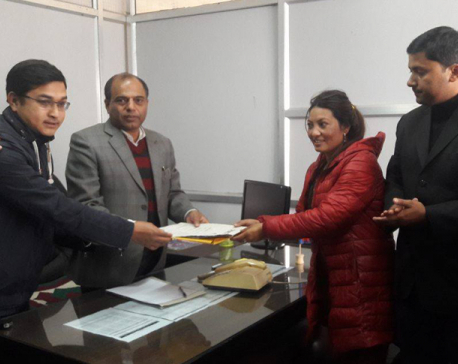 NSU is affiliated to the Nepal Congress and ANNFSU to the CPN-UML. On Wednesday, the elections were held in around 250 colleges including 21 constituent colleges of the Tribhuvan University (TU). TU has 60 constituent colleges and more than 1,084 affiliate colleges including community colleges across the country where around 350,000 students study, according to TU authorities. The FSU polls were disrupted in most of the constituent colleges due to padlocking by bickering student unions. "We are in the leading position across the country," claimed Nain Singh Mahar, NSU president. "We have won presidncy and majority members in 106 colleges, and secretary and members in 38 colleges. The ANNFSU has won in 75 colleges," he claimed. "We won in 11 out of 21 constituent campuses." But, the ANNFSU has claimed that it won in most of the colleges. "We are in the first position winning 101 campuses while the NSU has won in 89 colleges" claimed Sudip Sharma, spokesperson of the ANNFSU. Meanwhile, ANNISU-R, the student union affiliated to the CPN (Maoist Center) has claimed victory in 49 colleges. Vote counting is still underway in five colleges in Dharan, Pokhara, Ilam and Surkhet, according to the NSU.